U.S. Customs and Border Protection Commissioner Kevin McAleenan told reporters in Texas on Monday that, for now, the agency is no longer referring for criminal prosecution migrants caught illegally crossing the border with their children. McAleenan said the temporary change was “because of guidance” in an executive order signed by President Donald Trump last week that calls for detained migrant families to be kept together, according to multiple reports. McAleenan said he made the decision hours after Trump issued his executive order, the Los Angeles Times reported. Trump signed the order after his “zero tolerance” policy governing illegal border crossings led to more than 2,000 children being separated from their families. The policy calls for people who cross the border illegally to be criminally prosecuted. The families were split up because children can’t be held in jails. In his order, Trump directed the U.S. Department of Homeland Security to find ways to hold the families together. But the federal government's three centers for immigrant families have limited capacity, raising questions about whether such a plan is possible. A 1997 legal settlement also limits the amount of time that immigrant children can be detained to 20 days. Last week, the U.S. Department of Justice asked a judge to adjust the legal settlement in a way that removes the 20-day barrier. On Monday, the government appeared to be taking steps to address the capacity issue. Defense Secretary Jim Mattis told reporters that two Texas military bases — Fort Bliss near El Paso and Goodfellow Air Force Base in San Angelo — will soon house migrants who were detained after illegally entering the United States. 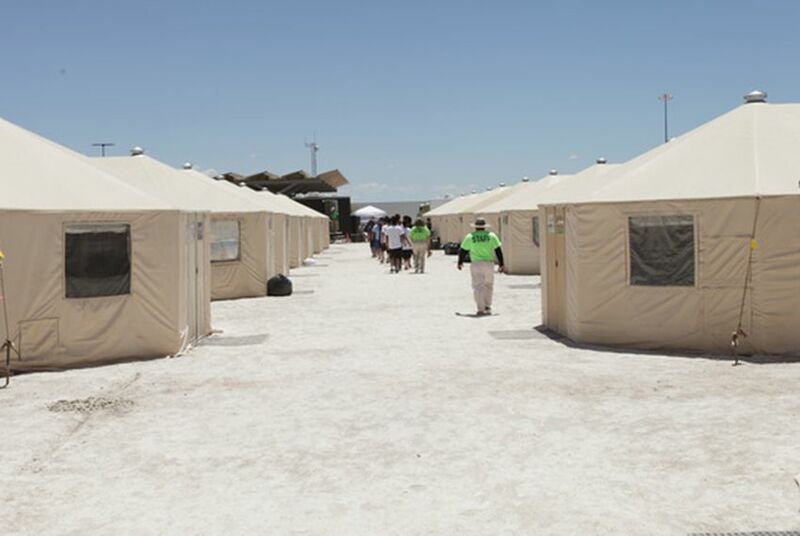 The bases will contain tent camps for the migrant families, with Goodfellow housing unaccompanied children, NPR reported. Mattis, who announced the move to reporters while en route to Asia, did not say how many migrants each facility would hold. The Pentagon announced last week that it had been asked to prepare to house as many 20,000 migrant children. But even with the decision not to refer families to criminal courts, administration officials insisted that the “zero tolerance” policy remains in effect. White House Press Secretary Sarah Huckabee Sanders reiterated that the halt in referrals is temporary, according to the Associated Press.